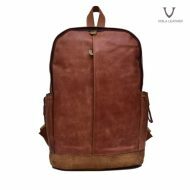 Voila Leather launch a backpack named Voila Ozzie, it is handmade by our experienced craftsmen using a combination of pull up cow leather and crazy horse cow leather. 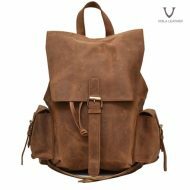 Voila Ozzie is a modern, elegant, simple, timeless, strong designed backpack for men and women who need a genuine leather backpack. 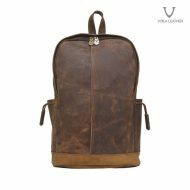 Leather Character : natural, original scratch-textured full leather (very leather), and a little stiff. 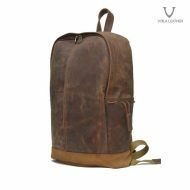 Feature : 2 front pockets 2 inner pockets, 1 inner compartment. 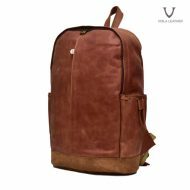 bag, storage for handphone, wallet, powerbank, etc. 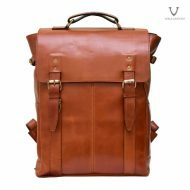 Voila Ozzie Leather Backpack is a medium-to-large sized bag fit to hold a 14 inch laptop. 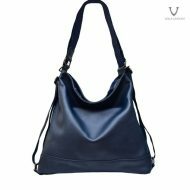 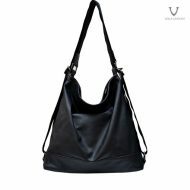 Voila Ozzie is modern, elegant, simple with wide and strong shoulder strap made of gray colored crazy horse cow leather on the front and lower side of the bag, complementing its simple and modern design. 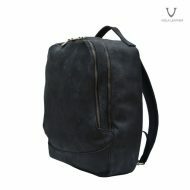 Voila Ozzie has a medium sized zippered outer pocket, a large pocket with magnetic button lock, and longwise main chamber wrapped with posh, soft, smooth velvet suede fabric lining for your valuable electronics or smartphone safekeeping, completed with one compartment that fits in a 14 inch laptop, two medium inner pouches for holding your smartphone, and a slot for your stationaries. 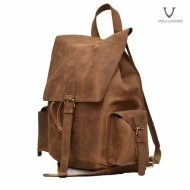 Voila Ozzie Leather Backpack we present is an answer to your, backpack lovers’, desire for a medium sized genuine leather backpack – perfect for the office, on campus, or daily activities, and it is suitable matched with your casual fashion or men’s work outfits. 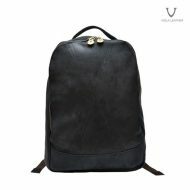 If you need or are looking for a modern, elegant, simple, timeless, original textured leather backpack, Voila Ozzie is the right choice.